If you ever been in a bad marriage or relationship, then you understand how it feels to have your heart broken and if you happen to be dealing with someone who enjoys lying, cheating and being deceitful, all you want is for them to leave you alone or to get out of your life. Many people that are in marriages or relationship grow tired of the drama or games and want or desire peace. What's worse than that is the time, money or investment you have put into them. Many men or women don't appreciate their good spouses while they are with them and most of them don't realize what they had lost until its gone. 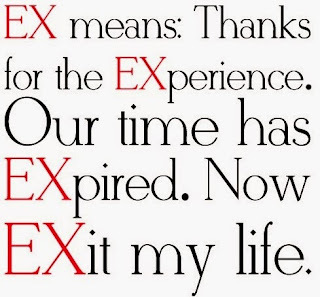 It seems that most men or women always want to come back to their ex spouse, just when the person they lost are beginning to start a new life or when they have found someone else. Like my late grandmother would say, "You never miss your water until your well runs dry". Which brings me to the question of the week, Why Won't My Ex Leave Me Alone? This question comes from an old high school classmate of mine. I ran into her at a local Wal-mart and it was good to see her after being out of high school for over thirty years. Just like myself, she was well kept and it appeared that she was doing well for herself. I noticed her while I was shopping for produce and walked over to her to say hello. Before I could say hi, she said," Chuck is that you? I smiled then said, Yes it is. Its the C.H.U.C.K. in the flesh! Then she said well you haven't aged a bit and then I said you still look good too Teresa, what have you been up too? Then she told me that she got married , then divorce, had four children that are all grown, they have graduated from high school, college and she now has six grandchildren. (All I could say to myself was," Wow a lot has happen since high school, because we both have similar experiences"). Then I said to her, Teresa you seem to be doing well and God has been good to you. Then she said, I can't say that God hasn't been good to me because he has, but I can't get my ex to leave me alone. We have been divorced now for five year and he married the woman that he cheated on me with. But I guess now he sees that the woman that he left me for, isn't as good as he thought she was. But that is his problem, because I have moved on! I have a new man now and I am about to get married! I smiled and said good for you , I am very happy for you. Then she looked at me, then smiled and said, Chuck why do you men do this? Why do you men always want to come back to a good woman, after you men have played, then ran around with those trashy women? Then before she can get another word out, I said Hey! Women cheat too and as you know good men always finish last. Sometimes you women leave us good men, for those hard types, you know the thugs, gangsters or the ones who are suppose to be good in bed. So women cheat too and there are just as many female dogs as well as male. 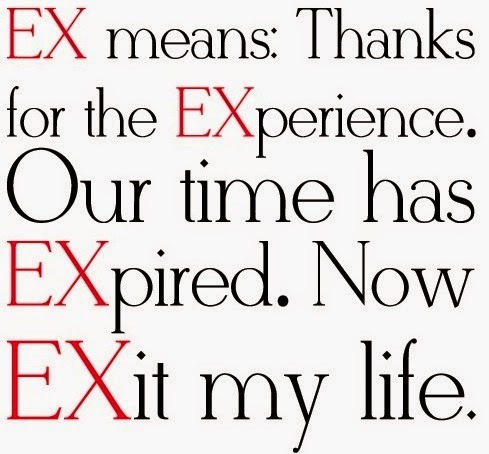 Besides that I already know why your ex won't leave you alone. Then she put her hands on her hips and said why Chuck? Then I said its because of your good cooking and then you probably turned the poor brother out! I heard about you Jamaican girls! I could tell that she was a little embarrassed because her girlfriends were around and she said , Boy you know I grew up right here in good old Louisiana, I ain't no Jamaican! Then she smile and then said, "Chuck, you are still as crazy as ever, but you are right because I have a lot of girlfriends that are like that". They treat their good men like trash and make it bad for the good women like myself. Which brings me back to the question of the week, Why won't my ex leave me alone? Why is it fellas or ladies that you always want to come back, after you have realized that you have made a mistake or that you were wrong? Why go back to something that has caused you so much pain or heartache? Why won't you leave your exes alone or Why Won't Your Ex Leave You Alone? Maybe you both fear being alone, the unknown or being by yourselves. Write in ,then express your thoughts or opinions on the subject. One simple answer, lack of discipline and control of their emotions. I can call them a bone head and leave it at that but that's to easy. You can look at it another way, they don't want you but don't want to see you happy with someone else. Some people are just plain selfish and inconsiderate. The problem is the grass is not green on the other side of the road, and wen they find it out, they become miserable. People who behave in this manner feel to believe they can do what they want, or believe they can walk on you like a rug, dust they feet and come and go in your life whenever that feel like it. The scenario is people do only what you allow them to do, and if you play the insecure victim, they will continue to victimize you. When they had you, they did not know how to cherish the blessing they had, and once the tables turned they want to walk through a revolving door, back into your life. The real reason they do it. They feel if they did it once or twice they believe they can do it again. Stop and put on the breaks! !